I’m a Fresh Air geek. Love that show, and I walk around NYC with huge Bose headphones listening to podcasts of great interviews by my gal, Terry Gross. So when she recently interviewed another hero of mine, the NYTimes’ PhysEd columnist Gretchen Reynolds, I received a nice dose of double happiness. Their conversation got me through rush hour on the subway nicely, in fact. 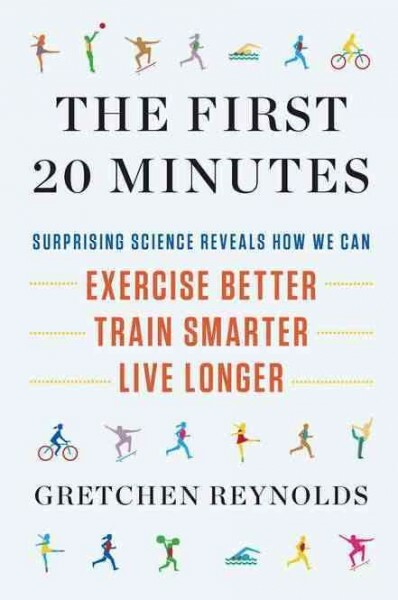 Reynolds’ new book, The First 20 Minutes, is about the importance of NOT being sedentary. A little exercise goes a long way, and Reynolds has the research to back up her findings. One of her tips, in fact, is to stand up every 20 minutes at work. Just stand. Or better still, walk around your office a bit. Science shows it really gets the blood circulating and has very strong overall health benefits. Reynolds conducts her interviews standing and puts her paperwork on a music stand in front of her. Yeah, I bet that looks odd but it’s a pretty solid idea. Here is some more take away from her conversation with Terry. Don’t Skip The Warm-Up: Science suggests that a very easy warmup — a light jog, for example — may be all that most of us need. “What you want to do when you warm up is warm up the tissues,” she says. “You want to get the muscles, the tendons — all of the parts of your body — warm, and the best way to do that is to use those tissues.” Reynolds recommends jogging before a run or an intense sports match. Personally, I start my workouts with a set of 10 walkouts: begin by standing and bend over to touch your toes and then literally walk your hands out on the floor ahead of you and inchworm your body down to the floor until you are in a pushup position. Dip and float through into an upward dog (or do a pushup), push back into downward dog, walk back to your toes with your hands, and then, keeping your legs straight and using your glutes, abs and quads to lift you, return to a standing position. It’s part yoga, part elementary gym class, and it will get your muscles warm and moving. Just what ol’ Gretchen ordered. Running’s Rewards And Risks: Running reduces the risks of heart disease and diabetes, helps maintain your weight and improves brain health. “There’s very good science that running for even 30 minutes or so doubles the number of brain cells in certain portions of the brain related to memory,” says Reynolds. “Running is wonderful for the health of your body.” But the injury rate among runners, she cautions, is extremely high — with as many as 75 percent of runners getting one injury a year. “So running can be very hard on the body at the same time it’s very good for the body,” she says. Humans Were Made For Walking: Walking may be the single best exercise that exists on the planet, Reynolds says. It’s low-impact and has a relatively low risk for injury. “Walking appears to be what the human body was built for,” she explains. Even 15 minutes will reduce your risk for heart disease and diabetes.